Cashmere is a highly sought after luxury product that comes with an understandably high price tag and we’re about to dig a little deeper to see why that is. The current Cashmere goats name is derived from Kashmir, a Province in India that borders with China and Pakistan. Kashmir has been producing cashmere for thousands of years, most commonly used in their well known shawls. The cashmere products from this area first started attracting attention from Europe in the 1800’s, and then continued to spread throughout the world. Today the majority of cashmere comes from the high plateaus of Asia, major supplier countries being China, Mongolia, and Tibet. The specialty fiber is collected during molting seasons when the goats naturally shed their hairs. Some countries such as China and Mongolia remove the fibers by hand with a course comb, while other countries like Iran, Afghanistan, New Zealand, and Australia shear the goats. Both methods are effective and from here the hair goes to be separated by a mechanical process known as dehairing, this is a very tedious process. Today cashmere wool defined by The U.S. Wool Labeling Act of 1939 is the fine, dehaired, undercoat produced by Cashmere goats (Capra hircus laniger). The fiber should have a mean maximum diameter of 19 microns and the co-efficient of variation around the mean cannot exceed 24%. There also cannot be more than 3% (by weight) of cashmere fibers over 30 microns. This specialty fiber is not to be confused with the straighter and more course outer coat that is called guard hair. On average a cashmere goat will produce around one pound of fiber a year, of that only 4 to 6 ounces is the fine under hair used in the production of cashmere. Cashmere is known mainly for its softness, and its insulation properties are often over looked. Cashmere fibers are highly adaptable, they have a high moisture content that allows insulation properties to change with the relative humidity in the air. This is what allows you to stay warm in the winter and cool in the summer; making cashmere great for not only clothing, but also great for rugs, carpets, bedding, camping, and sports equipment. “Cashmere and Camel Hair Manufacturers Institute.” Cashmere and Camel Hair Manufacturers Institute. N.p., n.d. Web. 16 Dec. 2013. <http://www.cashmere.org/cm/general.php >. Harris, Aisha. “Why Is Cashmere More Expensive Than Other Kinds of Wool?” Slate Magazine. N.p., 27 Dec. 2012. Web. 16 Dec. 2013. <http://www.slate.com/articles/life/luxury_explainer/2012/12/cashmere_why_is_it_so_soft_why_is_it_so_expensive.html >. Latex mattresses come in Natural, Synthetic, or a blend of the two. Latex mattresses are becoming increasingly popular these days, mainly due to the fact that some latex mattresses are 100% natural. This organic property appeals to the health conscious people as well as the Eco-friendly. Natural rubber is harvested by tapping; tapping is done by making a diagonal cut through the bark of a rubber tree and once the bark is removed, a milky white rubber fluid is collected. Trees can be re-tapped every couple of days, through careful tapping, an acre of rubber trees (around 180) can produce nearly 1,900 pounds of rubber annually. Since the trees are not permanently harmed, they continue to grow, making natural rubber a completely renewable resource. That same 1 acre of rubber trees is able to absorb enough carbon dioxide to cancel the output of 1 car driven 26,000 miles. Synthetic latex is made by polymerizing a monomer that has been emulsified with surfactants; this synthetic rubber was first created in WWII to make products for the military due to a natural rubber shortage in the US. Synthetic latex does have the same basic properties of natural latex and is typically less expensive. There is also a blended latex option that is just a mixture of the natural latex and the synthetic latex, the most popular being 40% natural and 60% synthetic. How does rubber become a latex mattress? Most companies make latex foam by using two popular methods, the Talalay or the Dunlop as seen below along with a new method called the Continuous, and is exclusive to Mountain Top Foam. After the latex mattress is made there are a few more options to choose from, is the entire mattress latex, latex over foam, or even foam over latex? Most latex mattresses can also be personalized with the options of soft, medium, or firm so you get the mattress that is just right for you. The Dunlop method (originally developed in the 1920’s) uses a gelling agent to set the latex and maintain the consistency of the foam structure, which is washed off at the end of production. The Talalay method (originally developed in the 1950’s) involves similar steps but flash freezes the molded foam in order to set the structure before vulcanizing it instead of gelling agents. Latex can also be made by using a continuous production process which, while technically a Dunlop method, does not use the traditional moulding process to shape the foam before vulcanizing it. 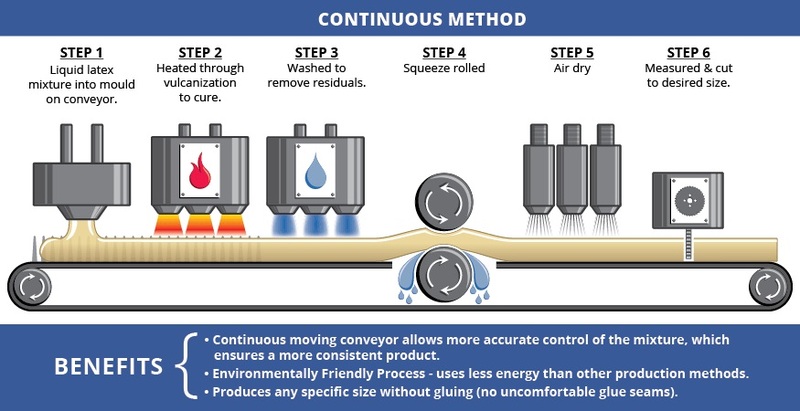 Instead, by using a continuous moving conveyor they are able to more accurately control the mixture which ensures a more consistent product over the Dunlop method and used much less energy than the Talalay method. *Natural latex has a variety of benefits and since it’s made from natural rubber, it’s completely safe. Because it’s all natural, it’s hypoallergenic. It’s even safe for those with latex allergies. People with latex allergies are not allergic to the latex, but a protein found in rubber. Thanks to the washing process, the protein, which is water based, is completely removed. “The Purity 100% Natural Latex Mattress W/Cashmere and Cotton Cover.”BedInABox.com. N.p., n.d. Web. 11 Dec. 2013. <http://www.bedinabox.com/product/6533.html >.